International ferry service between Portland, Maine and Yarmouth, Nova Scotia, Canada resumed in June 2016. The voyage takes as little as 5-1/2 hours each way. The Cat is back! As of June 2016 there is again international ferry service between Portland ME and Yarmouth, Nova Scotia, Canada on The Cat, a fast ocean-going catamaran car-and-passenger ferry that can take you on a Two-Nation Vacation. Daily summer ferry service is scheduled from June through October. Note that Nova Scotia keeps Atlantic Time, one hour earlier than the Eastern Time in Portland, so when it's 12 noon in Yarmouth, it's 11:00 am in Portland. The Canadian ferry, operated by Bay Ferries Ltd and Northumberland Ferries Ltd, departs Yarmouth, Nova Scotia at 08:30 am Atlantic Time on the 5-1/2 to 6-hour outward voyage, arriving in Portland about 12:30 pm Eastern Time. The ferry returns from Portland's Ocean Gateway (International Ferry Terminal; map) departing at 2:30 pm (14:30) Eastern Time, arriving back in Yarmouth about 9:30 pm (21:30) Atlantic Time. 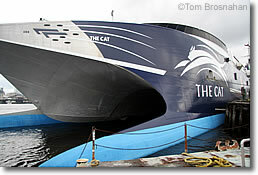 The vessel, The Cat, is a fast, comfortable catamaran car-and-passenger ferry boasting cafés, a cafeteria, movie area, children's play area, and gift shop. This means, of course, that if you go from Portland to Yarmouth, you will stay at least one night in Nova Scotia. 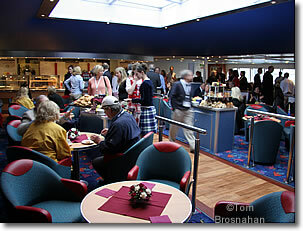 The next ferry from Yarmouth to Portland will be at 08:30 am Atlantic Time the next morning. To explore Nova Scotia on your Two-Nation Vacation, you may find it less expensive to rent a car in Yarmouth than to ferry your own car between countries. One-way passenger fares are US$107 per adult (14 to 59 years old), US$65 per youth (6 to 13), free for kids 5 and younger. Round-trip fares are slightly discounted. Also, check the current special offers. Fares for motor vehicles up to 20 feet (6 meters) in length and no more than 7 feet high start at US$199 one-way ($306 with the driver included); bicycles and motorcycles cost less, RVs more. Make your reservations online on www.ferries.ca. 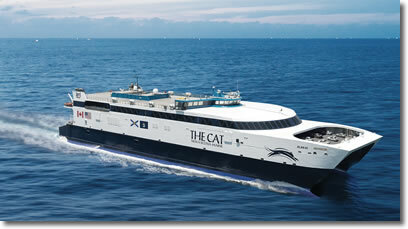 The CAT, the luxury catamaran ferryboat that zooms between Portland ME and Yarmouth NS Canada.